Romário de Souza Faria, better known simply as Romário,was born January 29, 1966 in Rio De Janeiro, is a Brazilian football player. He is one of a select group of players with over 50 goals in international matches and one of Brazil's most famous and outstanding forwards. He is considered to be one of the greatest footballers in the history of the game. He successfully pursued the 1,000 "One-Thousand" goal, a mark obtained only by 1 other player in history: Pele. Romario made his professional debut with Vasco de Gama (1987-1988). He played later on with PSV Eindhoven, in Holland, where he won four consecutive League championships. In the summer of 1993 he signed for FC Barcelona, where he won a Spanish League and the Pichichi, a trophy awarded to the league’s top scorer. In 1995 he returned to Brazil where, after a short stay in Spain and Qatar, he continued shining and scoring. He was the Brazilian figure of the national team that won the World Cup in 1994. In 1995 he was chosen the best player in the world by FIFA. The “Baixinho’s” first call for the national team was for a friendly against Ireland (0-1), on April 23, 1987. He scored his first goal for the squad ‘canarinho’ against Finland in April 28 of the same year (3-2), but his first appearance in the starting lineup was against Israel in June 1st, when he scored two goals for a 4-0 victory. In his first years with the national team, he obtained the silver medal in the 1988 Olympic Games and in 1989 he gave the Copa America to Brazil with a goal in the final against Uruguay in Maracana. In the 1990 World Cup he had to accept the bench in favor of Careca due to an injury, but in the 1994 World Cup, he had his retribution and led Brazil to the title forming a lethal duo with Bebeto. He scored 5 of Brazil’s 11 goals and was awarded the Golden Ball in 1995. Before that, he had to save Brazil when, in late 1993, the team was struggling for a ticket to the world cup against its historical ghost, Uruguay, and after that game, the then manager Carlos Alberto Perreira, constantly refused to call him. In the historical Maracana, feared since Brazil lost against Uruguay the 1950 World Cup final, Romario shined and scored the two goals which won the last game of the qualifiers to Brazil. The ‘Baixinho’, who considered that game his best one with the national team, won in 1997 his second Copa America in Bolivia. Romario’s last appearance with the Brazilian national team was against Uruguay, in the qualifying stage for the 2002 World Cup; where Brazil lost 1-0. He had later on a short stay in Spain playing for Valencia and, after returning to Rio, finished his international career defending for a few months the colors of Al Nasser of Qatar. Controversial for his relationships, his love for the nightlife, his absences from training sessions, fights and privileges, Romario has always figured in the media. This year (again the timing) he was forced to pay the former player, Zico, $22,000 dollars on moral damage reparations for using his image on the doors of the toilets of a bar he had opened in Rio. In the last months, Romario has suffered from injuries that kept him inactive for most of 2004. In November 10 of that year he retired from the international arena with a game against Mexico in Los Angeles, where the Mexican goalkeeper, Jorge Campos, also said goodbye. Since January 23, 2005 Romario plays for Vasco da Gama. On April 28th, 2005, Romário played his last game with the Brazilian national team. 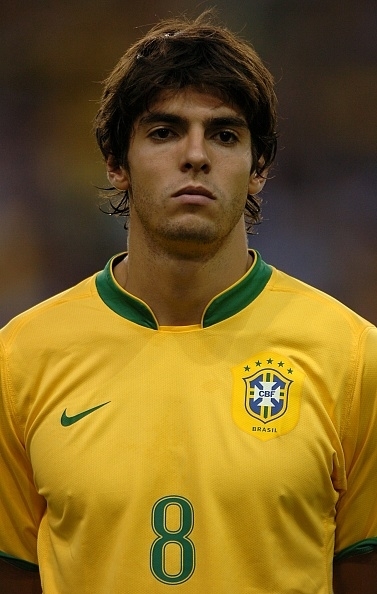 He scored the second goal on Brazil's 3-0 win against Guatemala and then left the field at the 38th minute. 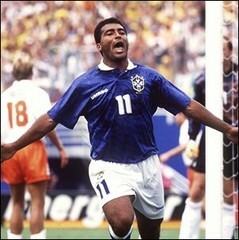 In 2005, at 39, Romario was the top scorer of the Brazilian Championship with 22 goals. Despite rumors stating he would play for Corinthians or Fluminense during the 2006 season, Romário decided to stay for another season at Vasco Gama. He is the second best scorer of all times in the Brazilian League being leading scorer 6 times. Romário came to Barcelona at the end of the "El Dream Team". Cruyff thought that Barcelona had been playing in the same manner for a few seasons and thought;that a slight change of playing style was necessary. He decided to begin playing with a real center forward. And Romário was exactly that. When one saw Romário play, one had the feeling that this player was born to score goals. In his first season with the club, he was the Spanish League top goal-scorer in the 1993/94 season with 30 goals. When the best ten goals of the season were to be chosen, the officials decided that they had to make an exception this year. They simply had to choose the ten best Romário goals and ten best goals for all the other players in the league. His goals were that exceptional. He was a real goal machine. When one saw Romário play, one had the feeling that this player was born to score goals. In his first season with the club, he was the Spanish League top goal-scorer in the 1993/94 season with 30 goals. When the best ten goals of the season were to be chosen, the officials decided that they had to make an exception this year. They simply had to choose the ten best Romário goals and ten best goals for all the other players in the league. His goals were that exceptional. He was a real goal machine. Romário was named as one of the top 125 greatest living footballers in March 2004. Many of Romário's fans, both in Brazil and around the world, feel that he is still, at 40 years of age, good enough to play for Brazil in the World Cup to be held in Germany 2006, demonstrated by the fact he was top scorer in the Brazilian league in 2005. Does the second set really deserves 7 Consistency? I read that he became a bigger slacker around that time. He even leaved Brazil's team camp to partying on some bar regularly. He did the same during his period @PSV, he was always at bars. So I also expect it during his Barcelona career. Guys, is there any videos of him running like a cheetah like his partner in crime, Ronaldo? I don't understand the DS 95, or even in 90, it's just not him.